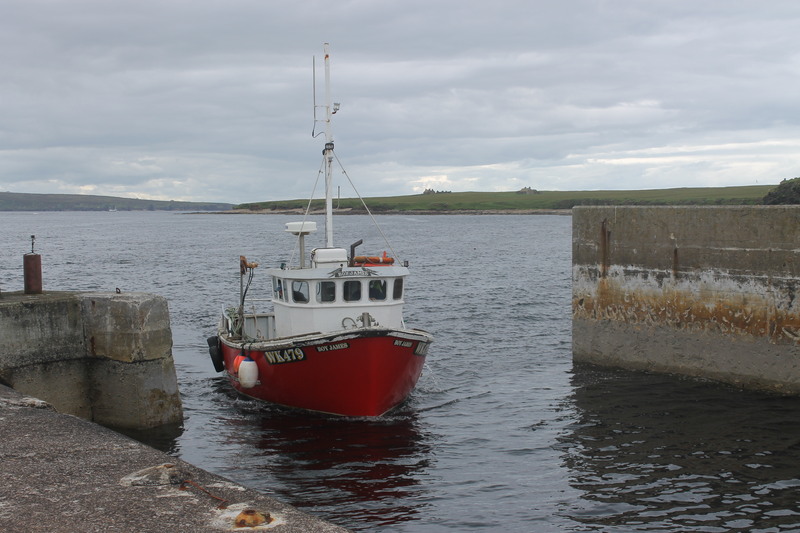 I spent Sunday on Stroma, a small island just north of Gills Bay in Caithness. 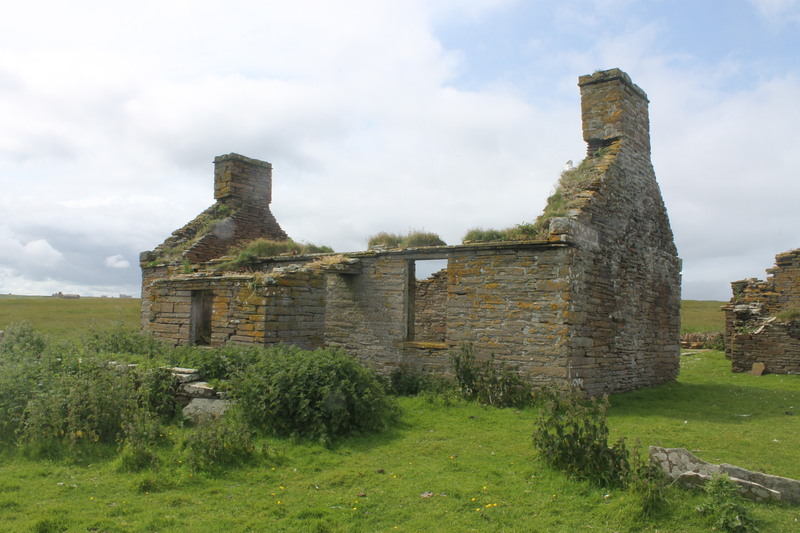 The island was doing quite nicely, population-wise, in the early 1900s, but as the years passed residents began to leave due to its lack of opportunity, increasing economic problems and it’s isolation from the rest of Caithness. The final native residents left in 1962, leaving only the lighthouse keepers until the lighthouse was automated in 1997. The island is now owned by the Simpson family who graze sheep and cattle there. They also, very kindly, will take groups of people across to the island for a day to have an explore. We have a trip booked for the end of August, but an opportunity came up for Sunday, so Bob and I decided one of us would go on this trip and the other could go later. I drew the “long straw” and got Sunday, so off I went this morning to catch the boat. We left Gills Bay and a short time later, arrived at the harbour. I was quite impressed by the piers they had there. Not something you’d expect to see on a island with no inhabitants! 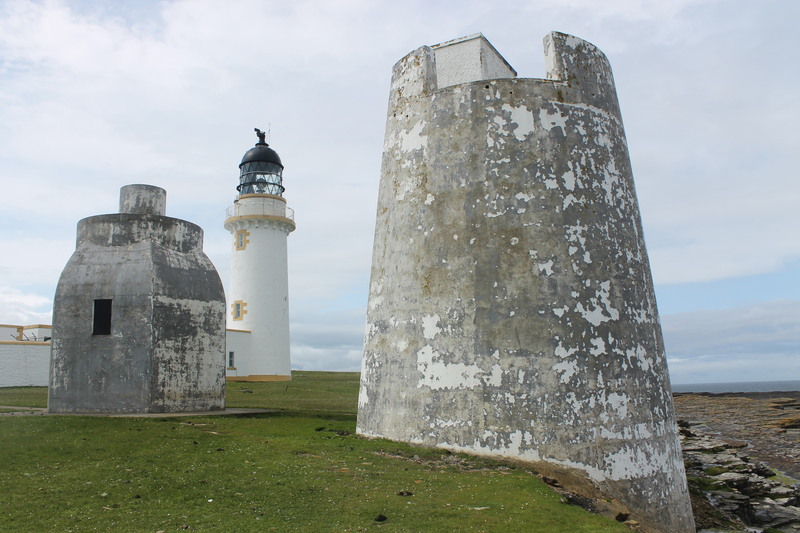 My first priority was to reach the lighthouse on the north point of the island, which I’d previously only seen from the ferry to Orkney. I set off on the path leading straight up. Almost immediately the derelict houses appeared, all in varying states – some with their roof and windows semi intact and others with no roof, windows and barely any walls at all. As I walked along I heard a gentle hum from behind which grew louder and louder. I turned and saw a man approaching on a quad bike. I stepped aside to let him pass and he joked ‘Cannae move fae the traffic!’ and continued merrily on up to one of the only houses that still looks intact. This house sits just next to the old manse which has a bit of a run down telephone box in front of it – a reminder that it wasn’t too long ago that the island was populated. A little further on is a memorial for those from Stroma who lost their lives in First and Second World War. I then followed a couple of sheep who led me (ran away from me) almost all the way to the lighthouse. The lighthouse is a typical Stevenson creation – a bit of a beauty. There is now a helipad next to the compound for the Northern Lighthouse Board to get easy and quick access to the lighthouse. They built a pier a short distance away on the east coast of the island for bringing in supplies when it was manned and it’s possible to see a building near this pier that has a very Northern Lighthouse Board-look about it (white building with yellow/beige-colour decorative stonework). Between the lighthouse compound and the coastline there are two stone structures. I was aware that there was previously a foghorn there, a fact which was confirmed by the presence of a warning sign saying ‘Noise’ near the lighthouse. These two structures are both different shapes and I’m not entirely sure whether they were both foghorn related or if one of them served another purpose. I was able to walk into both of them, although there’s not a great deal to see. At this section of coastline there are large, flat platforms of rock beyond which you can see a great deal of movement in the sea where different tides meet and clash. It’s a great little spot. From the lighthouse I took a quick look at a geo on the east coast before heading back inland. On the way I passed a ruined house with no roof. Inside the grass was growing and I spotted a baby gull in the corner shortly before it’s mother threatened to dive-bomb me! I found the main path again and decided to head to the west coast to take a look at the Subterranean Passage and The Gloup. 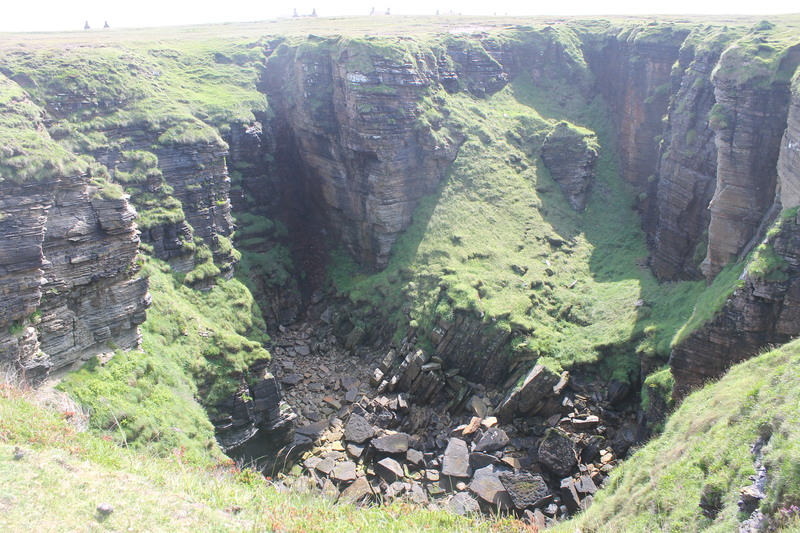 Due to the sheer cliffs and the state of the coastline I didn’t see a great deal of the geo at the entrance to the Passage as I wanted to make sure I didn’t end up at the bottom! The Gloup is fantastic. It’s a huge hole in the ground that is linked to the coast by a tunnel that runs under the ground out to the Passage entrance. A stunning thing to see, especially the vertical, flat cliff above the tunnel entrance. From The Gloup I went to head back to the path, but then realised that I wasn’t far at all from “Loch Lomond”, which was created by the island’s residents in order for them to sail model boats. There were a few little birds running about near the water. It wasn’t long after this, while attempting to head back to the manse, that I spotted a couple of great skuas. Having been to a few obscure islands in the last couple of years, I was aware that these aren’t the type of bird that you’d want to take home! Instead of reaching the manse, I hugged the coast to avoid being attacked by one of the beasts. 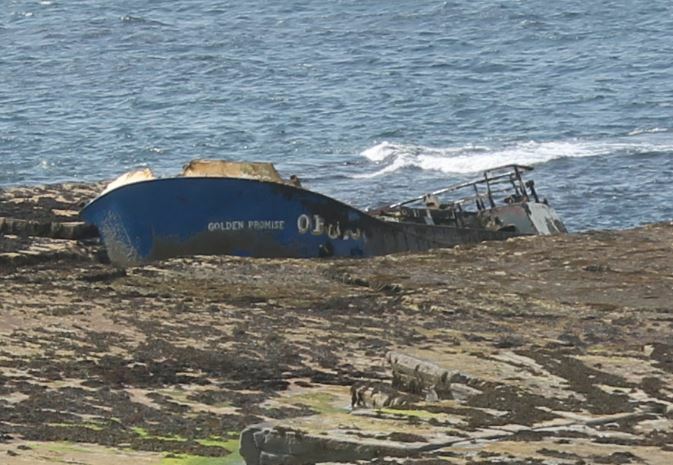 On another section of flat rock, I spotted a wrecked ship, the Golden Promise, which I have since found out was wrecked in September 2011 after its skipper fell asleep. Everyone had been rescued, but the boat is rusting away there now. I finally reached the path again and quickly wandered along to the highest point of the island, making sure that there were no skuas about. I then walked along a stretch of the south coast of the island before watching seals in the sea from a nice little beach near the harbour. As I wandered around the south of the island I could see the movement of the tide as the stretch of sand between the south west point of the island and the interesting beacon just off of the coast appeared and then disappeared again. I had a great day on Stroma, although I realised how much I’m now used to going to this type of place with Bob and not alone. The place has a lonely feel about it when you’re on you own. Although there were about 13 others on the trip, for the majority of the time we were there, I couldn’t see any of them. This may have been because they wanted to get pictures of puffins and I had other priorities. One thing that I felt particularly moved by while there were the measures people had taken to weather-proof their houses while they were occupied, such as walls around their gardens and doors on the sides of porches to protect them from the wind. It must have been a very sad day for each of the families when they left, knowing that these measures would no longer matter and the houses would be at the mercy of the weather from that day.